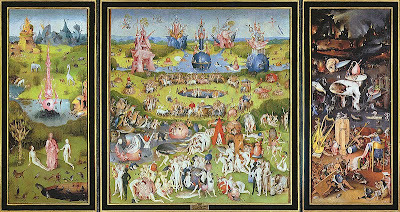 We had a dream......and in that dream we found ourselves strolling through the surreal terrain of Dutch renaissance painter H. Bosch in “The Garden of Earthly Delights”, and felt as though we were immersed in a modern reality feature film that only Tim Burton could direct. 15 minutes: too long for reality show media mongers, too short for the truly talented. Spend 15 more minutes reading all about it in our ‘In The Rear View Mirror’ May 12, 2009 posting "The Boyling Point".